Adsit was born and raised in Northbrook, Illinois, and began his comedy journey on the famed Second City stage in Chicago. 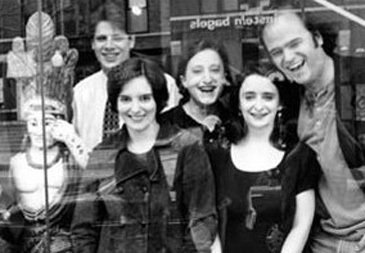 Adsit was part of the “generation” that included Tina Fey and Rachel Dratch. One of his most famous sketches, “Gump.” was named one of Second City’s all-time best during the theater’s 25th anniversary compilation. After moving to Los Angeles, Adsit landed parts in “Friends,” “The Office,” HBO’s “Mr. Show” and “Tenacious D.” From 2005-08, he co-directed, co-wrote and co-produced the cult hit “Morel Orel” for the Cartoon Network’s Adult Swim. He was also the voice of Orel’s father, Clay Puppington. He also voices Victor Frankenstein in the new show. His most recognizable role in on the NBC über-sitcom “30 Rock,” in its 5th season this fall. Adsit plays the eccentric producer Pete Hornberger on TGS, the show-within-the-show on TV’s funniest sitcom. HollywoodChicago.com interviewed Scott Adsit recently, on all of his career, including his latest Adult Swim animated effort on Cartoon Network, “Mary Shelley’s Frankenhole.” It’s sort of a Monster-Mash-Meets-Pop-Culture, as the first episode featured the reanimation of Michael Jackson. HollywoodChicago.com: If you were pitching Frankenhole to Mary Shelley herself, how would you begin to explain it? HC: Morel Orel had the look of Davy and Goliath. What was the source for the look of Frankenhole and what was the reasoning behind using it? SA: We wanted to use the look of the Universal Studios monsters, but we pitched it to them and they didn’t want it. We had to design our own versions of classic monsters and we wanted to get that look in stop-motion animation for the show. It totally looks unlike anything else on TV right now. One of the puppet fabricators from Morel Orel and Dino [Stamatopoulous, Executive Producer] came up with the concept of wrapping a photo around the heads of the puppets, like if we wanted Ron Howard’s face we could wrap in on the head and make it animate-able. The fabricator took the idea and made this new kind of puppet, taking the photographs and kind of making an origami with them, so that the puppet has a wire base, but everything you see on it is photographs. It’s a new form of puppet design. HC: You have a DNA mixer, time travel, seemingly the whole Monster Mash and life rejuvenation in your animation. How flexible does this make the script writing? SA: [Laughs] Yes, it makes our horizon pretty wide. We can do anything we want. Cartoon Network originally wanted us to be pop culture conscious. Because ‘Robot Chicken’ does so well for them. And so they figured the public wants jokes about Tom Cruise, so we’ll give that to them through our show. We were interested in topical stuff, and we opened with the Michael Jackson show. That would be our most mainstream pop culture reference, as I said typically it would be Ron Howard and Elke Sommar. HC: What freedom do you find in animation work that you don’t have in sitcom work? SA: Usually the answer to that is ‘budget,’ draw anything you want and then go build it. I guess it’s the freedom to play a bunch of different roles on the same show. And then I can have conversations with myself. HC: You took on religion fairly substantially in Morel Orel. What did you learn about your own relationship with religion or lack of it when working on the show? SA: It was kind of based on Dino and I’s childhoods. I was brought up a Presbyterian and oftentimes in the way I was raised in Northbrook, appearances were often more important that the truth. When I wrote for Orel I would tend to go that way, based on my own upbringing. We went to church because there was an initial interest in it and then we felt we were obligated to go, to look appropriate. So in Orel it was much more important to seem religious, than to know what your religion is. HC: You were born in the hometown of John Hughes, Northbrook, Illinois. Is there anything about your teenage years that reminds you of some of those moments you saw in his films? HC: What Chicago television do you remember from your youth that influenced you in your own TV production? HC: How does being a midwesterner help you navigate show business? SA: [Laughs] I don’t expect much from people, and I don’t feel I have any entitlement as far as the business goes. And if I get anything, I’m very lucky. HC: How competitive was Second City in the 1990s? How does someone maintain their sense of humor while at the same time vying for a spot? SA: We were very lucky in the ‘90s. I know before I was there, there was a lot of talk about the back-biting and people trying to devour each other. By the time I got there, and the generation I was with, we were all fairly well-balanced people who were interested in making art. A lot of that came from Del Close, and his disciples at the Improv Olympics [IO], when finally there was a détente in the early 1990s, and Second City started hiring IO people. That was just the best thing that they could have done. In my generation there wasn’t a lot of drug use or arguing in the cast. And everybody wanted the product to be good. It wasn’t a bear fight, which I heard it can be. HC: How did it feel to have the ‘Gump’ sketch be recognized as one of the funniest of all time? SA: It feels great, what can I say. I hear it’s toured on the road still. I would love to sneak in and watch it done from someone who learned it from someone, who learned it from someone, who watched me. [laughs] I’d love to see how they changed it, how they got it wrong or how they improved it. Who knows? 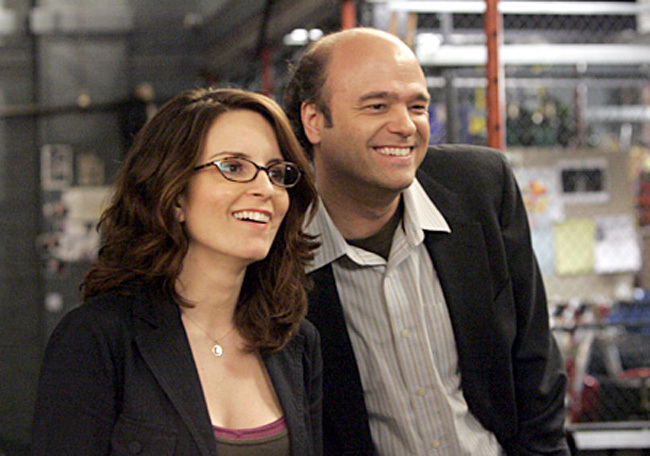 HC: Pete Hornberger is fast becoming one of the most intriguing characters on 30 Rock. Is there any particular type of person or co-worker that you’ve encountered that you’re basing the character on? SA: Well, yeah, a guy who was a producer at ‘Saturday Night Live’ for years, and currently produces ‘Late Night with Jimmy Fallon.’ His name is Mike Shoemaker, and Pete is pretty much whole cloth from Mike Shoemaker. He’s married, he’s got kids and he loves to avoid going home at night. [laughs] He’s trying to find some alone time. Pete wants some peace, and he just can’t find it. And he’s really afraid of freedom. HC: You once described the mission of comedy as “changing the world with our funny skits and songs.” What examples can you think of where comedy has changed the world? SA: It hasn’t! [laughs] That quote is on Wikipedia or IMDB and that was part of a much larger interview that was part of a joke I was saying. It was irony. But if I had to think of an example I think ‘The Daily Show’ has changed the way people encounter the news. And it has made people more interested in how the world works, now that they have seen the irony and presentation of how the news is filtered. It’s not a perfect news source, but it’s a sane voice in that realm. HC: Now do you think any comedy of yours has changed the world? SA: I think maybe Morel Orel has firmly sent some kids on a very independent road to hell. 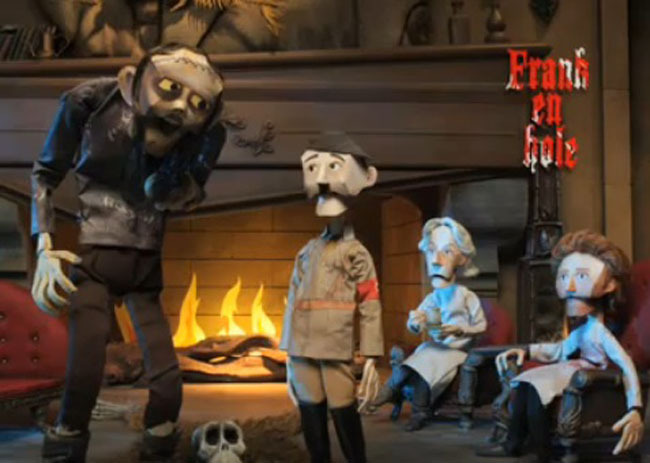 “Mary Shelley’s Frankenhole,” produced by Dino Stamatopoulos and Scott Adsit, continues every Sunday on Cartoon Network’s Adult Swim. Consult local listings for channel location and times. NBC-TV’s “30 Rock” begins its fifth season on Thursday nights this fall.